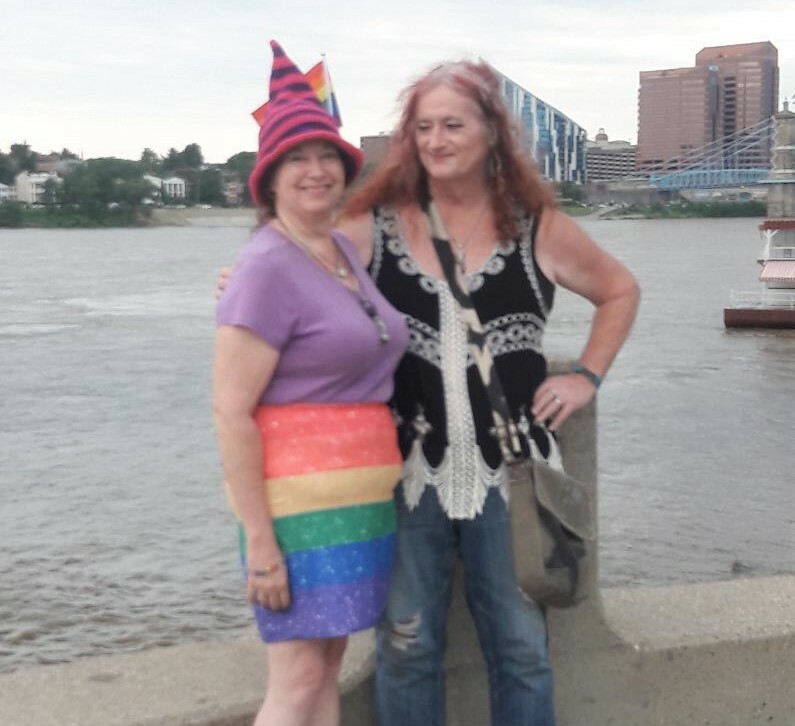 Thanks to an unnoticed hornets nest, one of the sets of free standing bathrooms suddenly became unisex at Pride Saturday when the women's room had to be shut down. The sudden debacle was taken in stride by the line of mixed genders waiting to use the only bathroom available. Unless you wanted to walk the whole length of Pride to get to the other one. Humorously, a big roll of toilet paper was passed up and down the line for those in need. The bathroom itself, had two stalls and three urinals. After much consideration, I decided to "take one (or give one) for the team and use an urinal for the first time in years. That way a cis woman would have a slightly quicker chance at a stall. As it turned out, no one would or could say anything anyhow. It took a lot of pressure off and made me feel a little privileged that I still had two choices in an emergency. 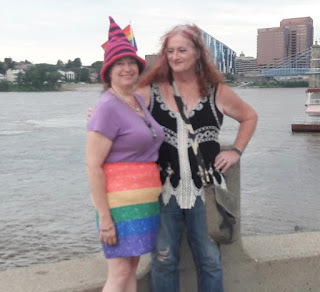 So glad you had a good Pride and so happy to hear that Cincinnati manages to put the T in LGBT+. London is trying but Brighton definitely doesn't; I hope that Croydon where I chair the trustees really does include the T! I have to agree about "T" being very evident at both the Polk Pride event and at the St Pete Pride. There were still a smathering of Queens in their getups but I saw an almost 50-50 mix of MtF as well as FtM. Here in Seattle, the big parade was yesterday. I chose, instead, to attend a "Celebration of Life" for an old friend of mine who passed away a couple of weeks ago. It seems that I could document my own transition along with the critical illnesses and deaths of family and friends over the last ten years. Each one has its own significance, and each one has led to my introduction to others who had never met me as I am (though, many of them had heard about my transition through the grapevine). Yesterday was no exception, and I guess I kind of had my own pride parade as I walked around the room with the purpose of introducing myself. Ya know, you have to have some pride in order to be able to do that! Getting the "You're so brave" comment from others seems to always come up. I try to explain that it's not so much bravery as it is the confidence I have in who I am, and, with thought of pride, I am also proud to be who I am. Some of the people I talked with would never even have considered attending a pride event, but they got a dose of it from me yesterday, anyway! The results of my efforts were mixed, but the worst I received was indifference. There was one man, a "born-again Christian," who was quite pleasant, albeit not totally accepting (I don't believe) of what I am "doing." That's fine with me, and I did receive a few hugs from others to make up for it. The last time I saw my departed friend was just a few days before he died of the terrible cancer that had ravaged his body. He was so frail, yet he made the effort to stand up and give me a big hug as I was leaving his house. This surprised me, as we had only seen each other once before since I began transitioning. Prior to that, he had had no desire to even see me. We were friends for forty years, but when he heard that I was transitioning, he apparently envisioned something disgusting and repulsive. When we did finally meet a couple years ago (at another funeral, by the way), I heard later that he'd told his wife, "Well, that was sure anticlimactic." Very shortly after that, he was diagnosed with the cancer that eventually took his life, but we still didn't meet again until just before his death. That hug we shared, though, made up for all the lost time. If there's a moral to this recounting, I think it's that we need to remember that pride is so much more than a yearly event. Being proud oneself shows through to others every day of the year, and the icing on that cake is when you learn that someone else is also proud to know you....just the way you are.